Can World Health Organization Be Trusted On Power Line Hazards? | R.E.T.A. Can World Health Organization Be Trusted On Power Line Hazards? Can the World Health Organization (WHO) be trusted to properly warn the world about the health risks associated with overhead high voltage transmission lines? Whenever individuals or community organizations raise health impacts as a serious concern associated with overhead high voltage power lines, they are told by electricity transmission companies that the WHO suggests there is no conclusive evidence of transmission line electromagnetic fields (EMFs) negatively affecting human health. Anyone who has tried to keep a new overhead transmission line from getting built next to their home, childrens’ school or place of employment, will have heard this standard response from their local transmission company. Information that has recently been made public indicates that the WHO may not be exercising the due diligence that one would expect from this United Nations health agency. The WHO has most recently been criticized for bungling the response to the Ebola outbreak, a sluggish performance that experts say cost thousands of lives (Edmonton Journal). “The Ebola outbreak points to the need for change,” said Dr. Margaret Chan, the WHO’s director-general. She admitted that the WHO was too slow to grasp the significance of the Ebola outbreak, which is estimated to have killed more than 8,600 people, mainly in Guinea, Liberia and Sierra Leone. In response to the sharp criticism over its handling of the West Africa epidemic, the WHO’s executive board recently discussed proposals that could drastically change the agency. Less than a year ago, medical writer Susan Foster wrote this shocking exposé on corruption within the WHO ranks, relating to scientific causality of harm to human health (primarily cancer) from electromagnetic radiation (EMR) – cell phones, Wi-Fi and other wireless technologies. The article suggests the WHO and the media have been unduly influenced by the very powerful telecommunications industry to erroneously report no health concerns with EMR. This is particularly alarming, considering 14 million new cancer cases are being diagnosed worldwide every year, and the number is expected to double over the next 2 decades. It is a well-known fact that the electricity transmission industry heavily lobbies leading health agencies such as the WHO and Health Canada, just as the tobacco industry did before the cause-effect relationship was definitively determined between smoking and lung cancer. Once the electricity transmission industry had successfully influenced the WHO many years ago to suggest there is no conclusive evidence of EMFs negatively affecting human health, is it any wonder transmission companies then cite the WHO in an attempt to placate those who raise health concerns every time a new overhead high voltage line is built? 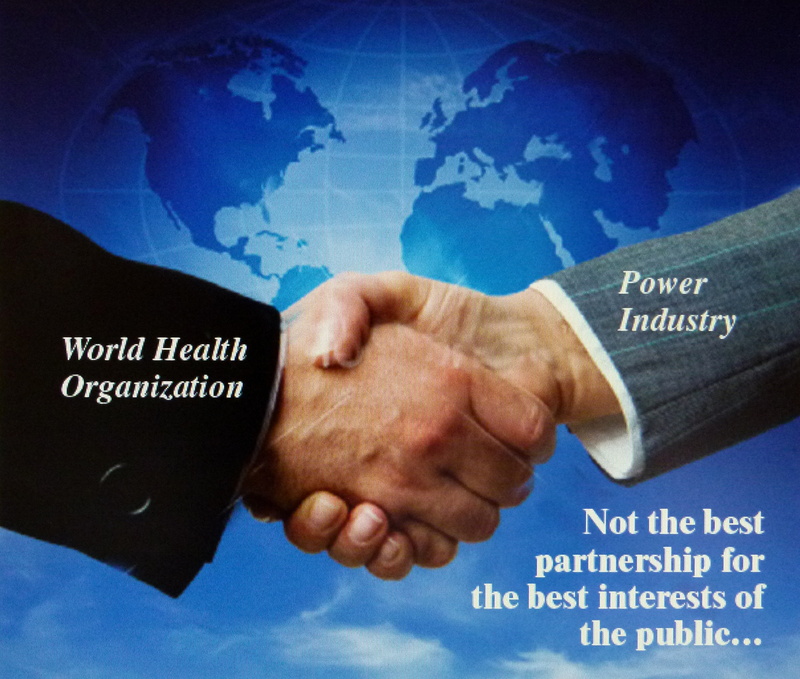 See this link for more information on corruption within the WHO, including collusion with industry. See this link for information on the many negative health risks of overhead high voltage power lines. ~ by RETA on February 3, 2015.